This week the challenge is to do some kind of Embossing! I decided to use an embossing folder I haven't used in quite some time: Bloom Dots. 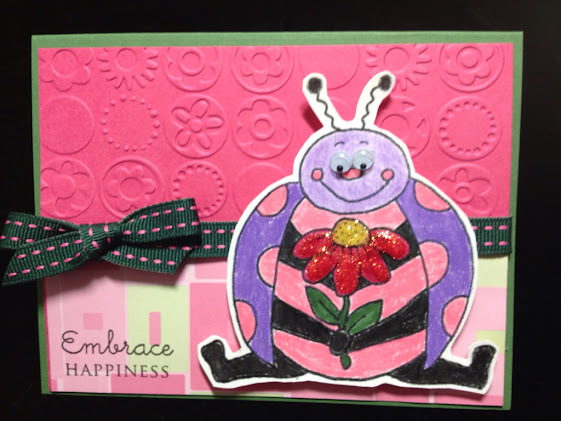 A Flower for you Ladybug image is from Sweet 'n Sassy Stamps. Card front: SU Melon Mambo 4" X 5 1/4"
Be sure and check out this week's challenge HERE! This is adorable. Love the pinks. I totally love that embossing folder! I wonder if it is still available - great card! Enjoy your weekend and thanks for another challenge! I LOVE embossing too!! It just adds so much to a card or project! Your card id so adorable and so is that embossing!